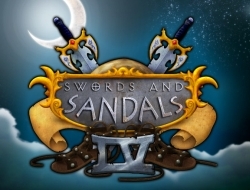 This is the fourth version of the popular game Swords and Sandals, in which you will get even more options and the combat system is even better than before. Create your own gladiator and choose his height, weight and combat prefferences. These first attributes will determine how you will have to play it in order to win matches. Make sure you will try and win every duel in arena at first, so you can get the money and the experience points, to buy new armor pieces and weapons and to add stat points to your character. Take turns and choose combat options and your hero will do whatever you say. Try to outhink the opponent, but some luck is needed as well, because some abilities only have small chances of hitting the opponent and causing damage. Use the mouse to fight and navigate through the menus. Swords and Sandals 4 10.00 between 0 and 10 based on 1 votes.